A laugh-out-loud alphabetical offering that is a sure crowd pleaser! If there's any book featuring alphabets that a kindergarten to a grade 2 kid, (as in older kids who have outgrown learning the alphabets) would enjoy, I can safely bet this is definitely THE one! Featuring a cat with super-silly expressions to present the alphabetical list, Bad Kitty is a no-brainer choice that can elicit tons of laughs among children and grown-ups alike! Thanks to my kindergartener's goofy and silly manners and expressions finding their way to the dinner table and bedtime, it was only natural that I would pick this one for her. Bad Kitty is a clever and hilarious offering of things and events in an alphabetical order, not once but four times, featuring the good/bad and bad/good moments of an action-packed day of a very high-energy kitty. I am sure you are wondering what the good/bad and bad/good moments are! 1) Kitty starts her day learning that her family has run out of her favorite food. The only available options are healthy and nutritous foods that go from Asparagus to Zuchini. 2)Upon knowing she is left only with those "healthy" options, she decides to become a bad kitty. Who would have ever thought that next would appear an A - Z list of all her bad behaviors - Ate my homework, Bit grandma to name a few of the 26 odd ways in which Kitty misbehaves! 3) What happens next? Kitty's owners bring food from the store that ranges from An Assortment of Anchovies to Baked Zebra Ziti. 4) Kitty repents for her bad behavior and repairs all the damage she had masterminded in the house with a final list of good alphabetical deeds such as Apologized to grandma, erased the walls, and such goes the list of sweet things she does for the family. That wraps up the four different alphabetical order of experiences in a day's life of a "full-of-attitude" kitty. Really, this book is replete with goofiness galore. The illustrations are charming and captures fully the "full-of-attitude" expressions of Kitty and the colorful foods. Purple definitely stands out on the cover as you can see for yourself above (thanks to LOOKYBOOK). The Kitty and her expressions are sure to steal your children's hearts. Be prepared to appreciate the numerous ridiculous ways in which alphabets get manifested, if in fact choose to read the book with your children. As for the negatives, you can't help but pause on certain random words, and wonder if they are bit of a stretch...well, if you look at the big picture, which is the possibilities of expanding your little one's vocabulary, it really does not matter. And thankfully parents don't have to worry too much about PC factor - (as in the political correctness) But not to ignore the feelings of those feeding their little ones with the foods the author describes as "yucky". And lastly, if you are a vegetarian family like ours, it may be hard to digest a few words here and there, but you definitely get used to words such as Quail Quiche after one or two reads. Bottomline, go ahead, have fun and open your children's minds (and yours too since we didnt have such lovely apbhabet servings when we were little! :-)) to a broader set of vocabulary than most books in the genre. If you are in a mood to get quirky and goofy with your children, pleas don't wait...go get this uniquely cooked up list of alphabets is definitely for your family. And of course, it's great that you can peek into the book on the above Lookybook too. 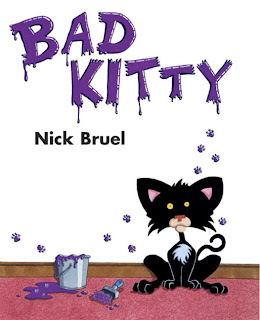 Extra notes: Author Nick Bruel has plenty of award-winning books to his credit. In fact, a new book Melvin Bubble has been receiving lot of media attention as well (it was featured on Martha Stewart show) Poor Puppy is yet another clever sequel to Bad Kitty - please don't get me started with this book now...I can't stop raving about Poor Puppy's energetic adventure with Bad Kitty. More on that in my next review! Lovely review Prabha ! I flipped through Lookybook and found this book quite interesting. I am sure this will be a big hit with Sooraj !! !